Through Peak National Park (Blue John Cave near Castleton – peat stone). Mountainous country. Confused on way near Chapel – in to Frith and Congleton and coming out of Wrexham. To Betws-y-Coed in mountainous country. Rocky – stream through village. B&B £3.75 / £3.50. Walk up the river side. This entry was posted in Family History, Jim and Elsie's 1978 Tour and tagged Casey on June 22, 2017 by Jennie. Breakfast at 8. Early start. Gone about 4 miles when we discovered we had left this book, maps and papers in the bedroom. Returned and joined a traffic queue of about 3/4 mile into Stirling. Picked up the motorway and fast travelled to Gretna Green. Bought some jumpers £75 each. By passed Carlisle and headed for the Lakes District. Lake, bare hills with sparse trees. Trees along edges of lakes. Suddenly came upon Keswick a large bustling tourist town. Cars everywhere. Difficult to park. Had our rolls in a national park wooded area near the lake. At Windermere walked a little of the town and then drove down to the wharf area. People everywhere walking the streets. Many people coming off and around the area where the excursion boats leave. Pretty drive through the tree lined roads to Kendall and to Kirkby Lonsdale – a neat little town – narrow streets and a square and lots of eating places. Stayed with Mrs Bradshaw. The Parko’s and Batto’s had left there that morning. They had come back and had 2 nights. 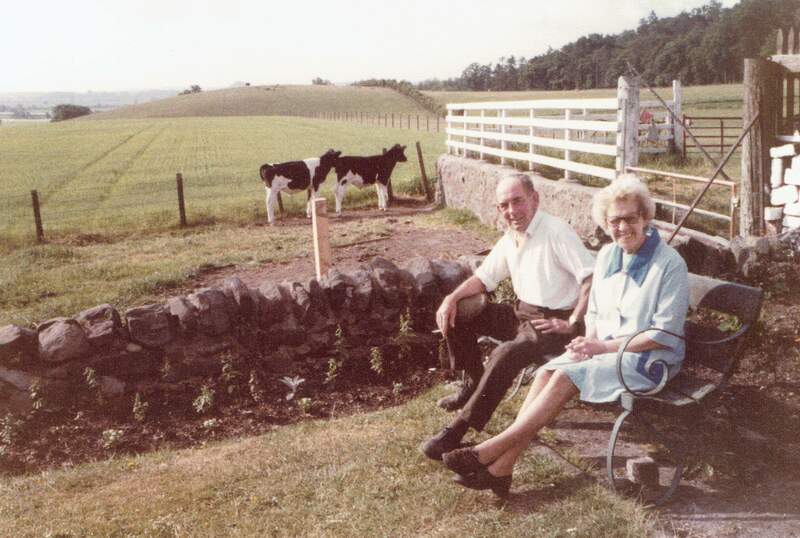 This entry was posted in Family History, Jim and Elsie's 1978 Tour and tagged Casey on June 20, 2017 by Jennie. Visited Stirling Castle. All the Scottish monarchs have been crowned here. In very good order much restoration work going on. 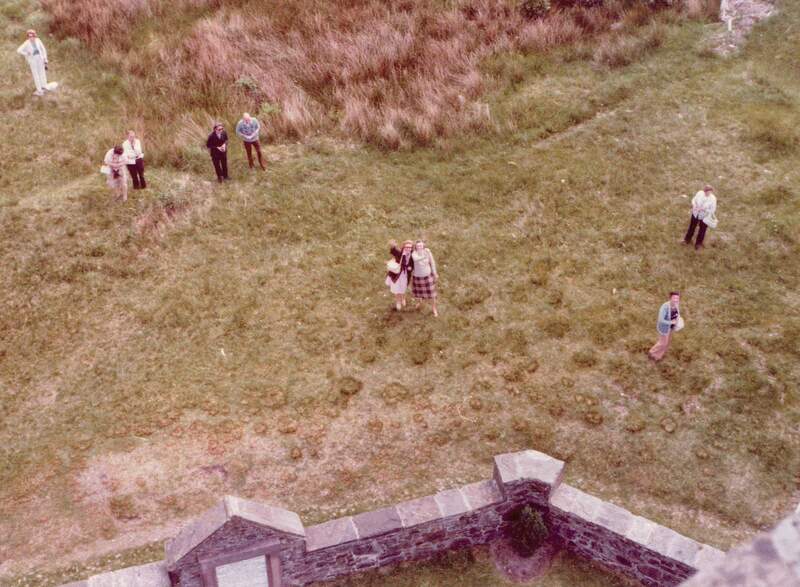 Castle overlooks the whole Forth Valley and used to control all movement to the north. Great Hall used as military barracks for over 300 years by the Argyle and Sunderland units. All interior additions are being taken out and the place restored. The original type windows being done in stone. Baptism Hall, Banquet Hall now museum for the silver of the Scottish units. Large silver centre piece to commemorate the Scots in the South African war and other places they have served. The Royal apartments and some of the circular wooden carvings – known as the Stirling Heads that used to decorate the ceilings. Out to Callander. Lunch overlooking a small river. Browsed through the shops looking for bargain sweaters. 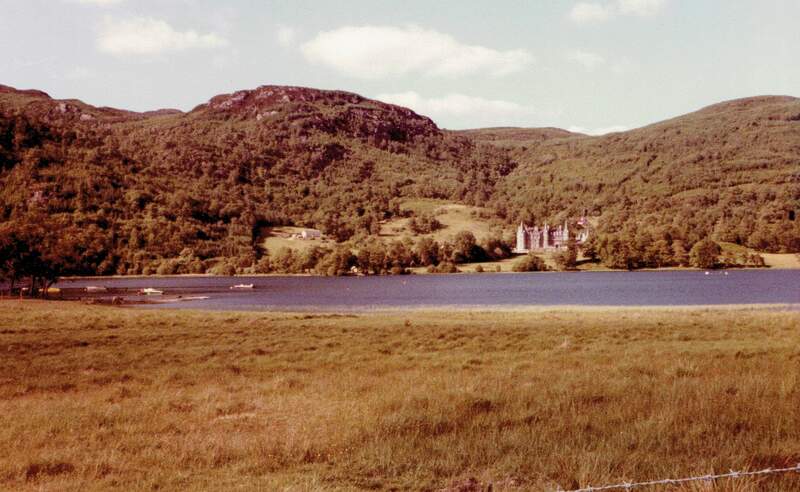 Out to the Trossachs – large rugged mountains that overlook Loch Venacher and up to Loch Katrine – the dam for Edinburgh’s water supply. Lookout on hill top overlooking the Trossachs. 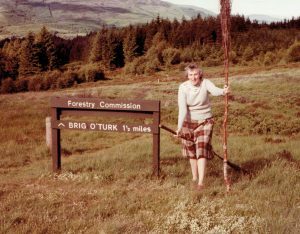 Photo of Elsie and the fire-brooms. Mrs Stirling talked on so we had a late night before our usual supper. This entry was posted in Family History, Jim and Elsie's 1978 Tour and tagged Casey on June 19, 2017 by Jennie. Breakfast 9. 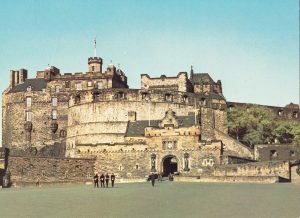 Drove round to find way to Edinburgh Castle. Had lunch below the walls. Walked up and had a guided tour to show main features. 9 gates originally to protect entrance. Crown sceptre and orb on display in special secured room. Walked down the Royal Mile with many of the tourist shops open. 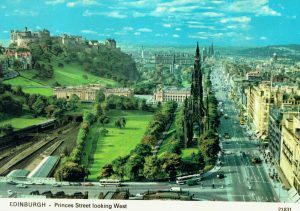 Came past Waverley Station. Took sightseeing bus – the sea, the city, the hills. Down to Portobello area out to foothills of the Pentland Hills and into city. Very rough ride in the double decker. 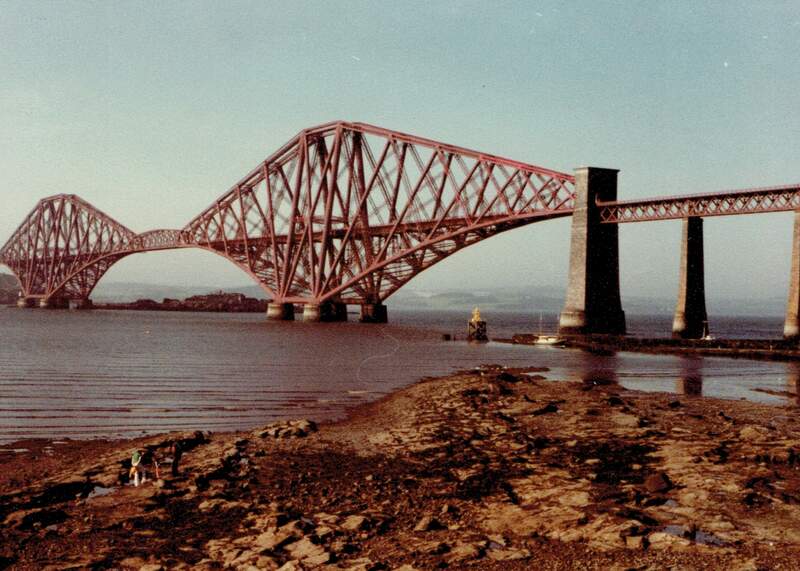 Drove to Queensferry South and viewed the Firth of Forth – Rail 2600 yds (1883-1890) and the Road Bridge – 2000 yds (1964). Back to a lavish supper. This entry was posted in Family History, Jim and Elsie's 1978 Tour and tagged Casey on June 18, 2017 by Jennie. Drove around Aberdeen. 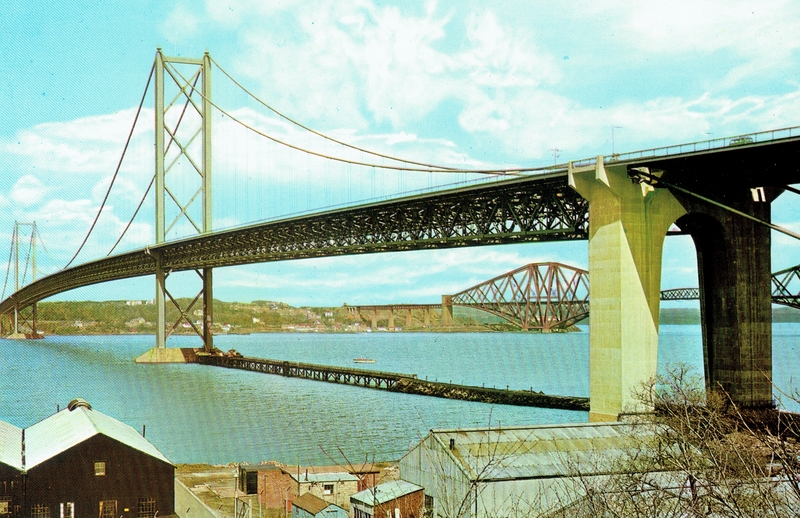 Down to Dundee. Long bridge over the Tay. Highland games were on at Newburgh (weather fine and hot). Had lunch. Pipe band came in. 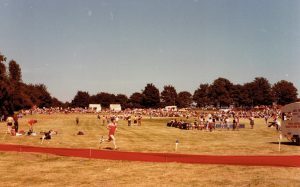 Junior races. Cycle races, shot put hammer throw. Large crowd in amphitheatre of private grounds. Left at 3.30. Visited Falkland Castle. Some of it goes back to the 1600s. Started to look for B&B. None about. Past Forth Bridge and across towards Stirling. Found a farmhouse about 8.30. Very big supper choice. Pikelets, toast, biscuits, small cakes, jam, honey, tea, coffee (£3.50). Mrs Stirling, Craigstow Farm, Stirling. This entry was posted in Family History, Jim and Elsie's 1978 Tour and tagged Casey on June 17, 2017 by Jennie. Breakfast 8.00. Into Inverness – very cold. Looked for pair of shoes. Difficulty getting the right fitting. Pair at Melvilles – £19.95. Inverness very busy with traffic through the city. Decided to go via Peterhead. Flat fully cultivated land. Good travelling road. Stopped at Banff, right on the coast. One lady said she hoped that summer had not gone already. All the locals were heavily rugged up and had roses in their cheeks. 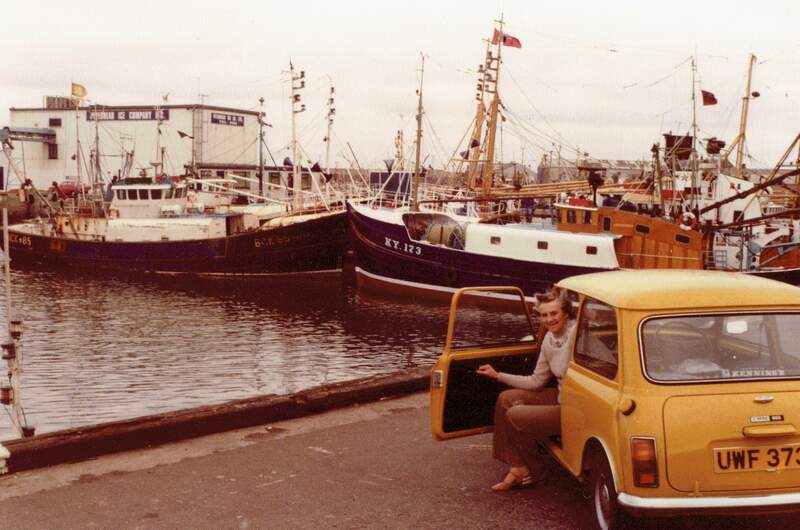 Peterhead is a very large town/city with very many large fishing boats. At the garage E asked if anybody knew the Hay family. Lady gave her the address of a Tom Hay, Jamanca Street. He tried to help and suggested she try Peter Hay, King Street. They asked us in but they had no relations in Australia. They said the Hays of Coldwells would probably know which one it would be. Time was running out so we headed off for Aberdeen. Lack of B&B signs. Drove through and found a place 3/4 mile out. Seems just a place (£4 each). This entry was posted in Family History, Jim and Elsie's 1978 Tour and tagged Casey on June 16, 2017 by Jennie. Farewelled the Batto’s and Parko’s – they have 10 days before they leave England for Singapore. High climb overlooking Loch Loyne. Interesting drive through Cluanie past a couple of reservoirs (low in water) between very high mountain peaks shrouded in the gloomy mist. The Five Sisters [of Kintail] were magnificent in their grandeur. To Kyle of Lochalsh where we took the ferry to the Isle of Skye (£1.34 each eay). 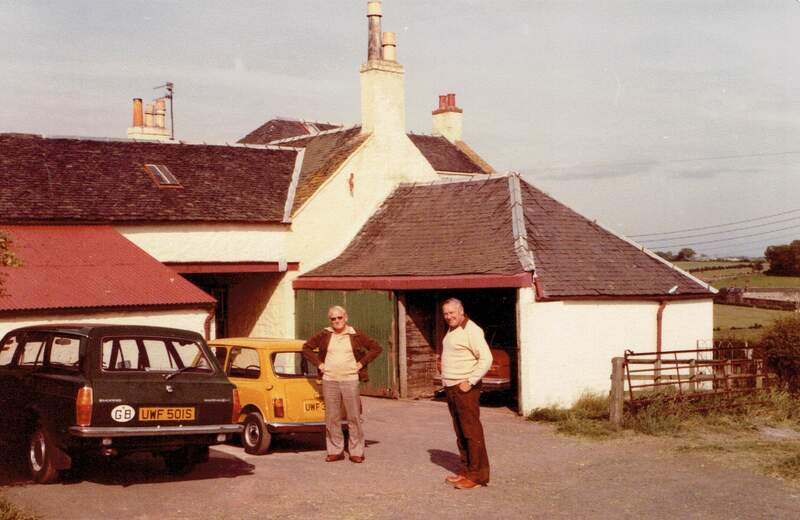 Drove to Breakish and Broadford – small – a couple of shops. Fish and chips in car. Back same road to Loch Ness. Very low on petrol. Quite picturesque. Took a road to by-pass Inverness and lifted quickly up to poor tableland. Tea at Beauly and drove to Dingwall. I started to look for B&B. Took road over very extensive mountains all covered with heather (not out until Aug-Sep). Found B&B 1/2 mile off road near Tain. £3.50 – Louise and Tom McGregor. Very comfortable. Special supper (pikelets and selection of cakes). This entry was posted in Family History, Jim and Elsie's 1978 Tour and tagged Casey on June 15, 2017 by Jennie. Out to Spean Bridge to the Woollen Mills. Very large stock looks like a place catering for bus stops and tourists. Rather expensive. Back to town to fit Doreen. Bought a packed lunch – rolls, meat and fruit. Twisty road to Mallaig (the road to the Isles) narrow with passing places. Mallaig a picturesque fishing port. Alongside lake and sea. Rhododendrons growing wild in large patches. Back through Acharacle and Strontian on a very restricted road with narrow passing places and as a result could not see much of the view. Road very slow. Ferry crossing at Corran – 9 cars loaded on to a turntable on a large barge arrangement. The turntable is swivelled around by hand so that the cars can drive off. 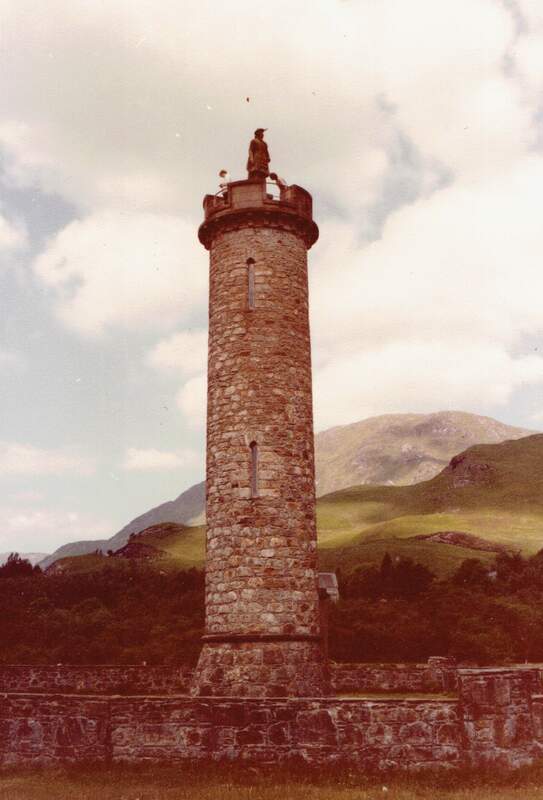 Climbed Monument to Clansmen who followed Prince Charles – Glenfinnan. Back just before 6 o’clock to have the “poached” salmon (an 8lb divided by 12 plus the family) – a small portion each. In Bill’s bedroom – much talking with Doreen taking the lead position. This entry was posted in Family History, Jim and Elsie's 1978 Tour and tagged Casey on June 14, 2017 by Jennie. Ayr – round and round. Irvine, Paisley. Alongside Loch Lomond – very calm with high mountains in the background. Picturesque drive alongside the lake to Tarbet and wrong road turn took us to Crianlarich where we had lunch at the rooms in the railway station. 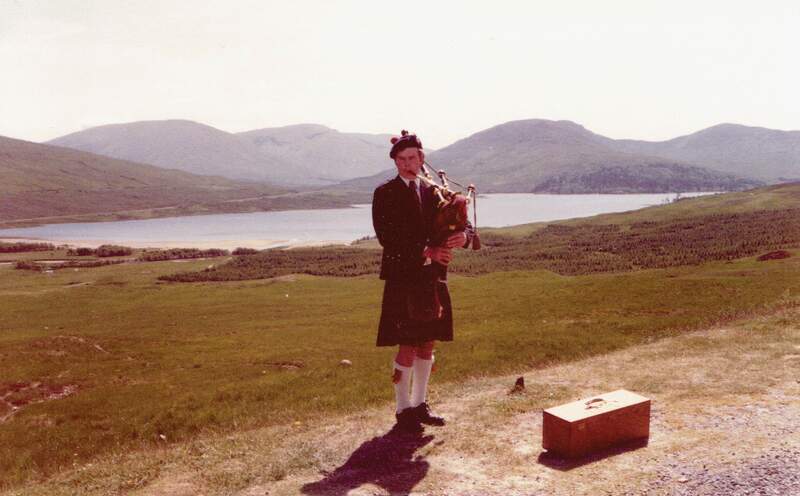 Through bare hills and some pine trees to Glencoe – scene of massacre of the McDonalds by the Campbells. Over new concrete bridge at Ballachulish to Fort William. Hill view $3.75 + £2.50 for dinner. Rooms with H & cold. This entry was posted in Family History, Jim and Elsie's 1978 Tour and tagged Casey on June 13, 2017 by Jennie. 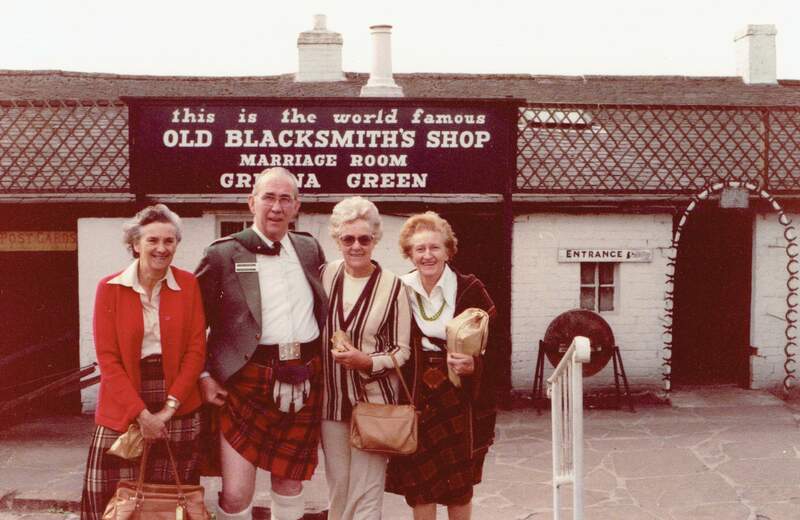 Stop at Gretna Green. Photo with Scotchman. Bought jumper for £5.50. Dumfries [and] New [sic] Galloway through Glentrool Forest Park. Lots of pine trees. Newton Stewart for a dine – late lunch. Quite cheap and tasty – salad, rolls. Glenluce, Ballantrae, Girvan to Ayr. Stopped at Bogen Farm – up high on hill top. Near airport, very clean milking sheds. Supper cheese biscuits, small cakes and fruit slice. Very comfortable room £3.50 each. This entry was posted in Family History, Jim and Elsie's 1978 Tour and tagged Casey on June 12, 2017 by Jennie.